I don't want to sound like a broken record, but remember: see me as a friend recommending what has worked for her. I'm not a sleep expert!! Besides the techniques and the methodology, there are certain items that can help your little one sleep better. These are the things that have worked for us! This list is for a baby over 6 months that is already out of the swaddle and the dock-a-tot! So what is "white noise"? White noise is noise containing many frequencies with equal intensities. There are many reasons why we love using a white noise machine. - It works as a trigger. By now he knows that turning it on means that it is time to sleep. There are studies that state that it can also help the baby (and you) sleep longer and deeper. - We also live in an apartment on the smaller side with thin walls. So it also helps us live normally after he goes to sleep- meaning we can have friends over, cook, watch a movie, etc. Just like I mentioned movement can create dependency; I know using white noise also worries parents in the long-term. It's a personal decision. If you live in a quiet house, maybe you don't need it! What about "naps on the go"? We downloaded a white noise app that helps when we are not at home. What about traveling? Our white noise machine is not that big, and we have taken it with us to Mexico, California, and New York. It really helped us, especially in NYC!! The term "lovey" is used to define any comfort object a baby brings to bed. The most common ones are teddy bears or blankets - ours is a mixed of the two! It has the head of a plush animal but it's like a little blanket. Ask your pediatrician when you can introduce a lovey. Some say it is okay at 4 months, while other prefer you to wait until 9 months or when you baby is able to move an object away from his/her face. The first day, I put the lovey inside my bra for a few hours so it would take my smell (and remind him of me!). Then, at the night feeding, I put it between us and rub his face with it- so there is an association of comfort and safety. Now he LOVES his lovey, he grabs it before going in his crib and rubs it while falling asleep (it's adorable). I got his lovey on Etsy and I personalized it with his name on it. Yes, yes! You want your baby to be able to nap everywhere. But especially during "Nap training", it's super important to make sure his/her little room is as dark as possible. Scientifically, humans sleep better when it's dark...as simple as that! Remember that everything they see is a distraction. Our room isn't that dark, but we put a few cardboards around the curtains to make it darker. Ok, this one is more for you than for the baby..but it gives you peace of mind! Sometimes, babies cry completely asleep! They are connecting sleep cycles and if you run quickly to the room, you are only waking them up! Now that Nico is sitting up by himself. I also like monitoring if he is sitting up or laying down. We call it NICO.TV , because sometimes we look at it more than we should! I have a few friends that have the AngelCare or the Owlet- these two also measure heartbeat/oxygen levels among other things. I don't find it necessary , but whatever gives YOU peace of mind while they sleep is OKAY! 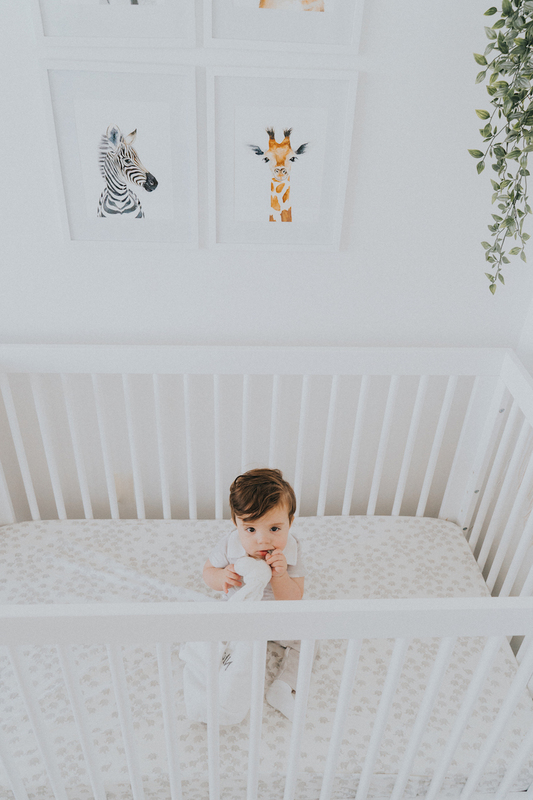 Many experts worldwide recommend not having anything inside the crib to avoid the risk of SIDS. But you want your baby to be cozy. I personally love zipper onesies- because you can change them quickly in the middle of the night in case of any poopy emergency. This is such an important item!!! The first night of "sleep training", Nico woke up completely soaked in pee. We were using Pampers Pure diapers- which we have been using since day one and we love them but they are not meant to be used for that long! We headed to Target, and the only diaper brand that had Nico's size was Honest. We got it, and OMG they did not work AT ALL. He woke up soaked on night 2 again. - After you drop the night feedings, the diapers don't get SO FULL overnight. I found out this to be TRUE! - The brand that was mentioned the most was Pampers Overnight. It's the one we got afterwards and it's amazing! We have't had any leakage- even after 12 hours. - You can also double up- put two diapers just in case. But I don't think that's very comfortable for them. - SIZE UP in the overnight diapers. Nico is a size 3 right now, so we get the Pampers Overnight size 4. Let me know if there is anything you would add to this little list!! I don't have a little one, but yours is the cutest! Thank you for sharing the tips! I'm imagining he rubs the Lovely while falling asleep, aw~ so adorable! Thank you for sharing, Daniela. Reading your posts, seeing how you go about problem-solving and trying different tactics to take control of issues, and learning about specific, legitimately useful resources out there make the prospect of motherhood just a little less daunting in my eyes. You are doing a great job as a mom and a blogger -- keep it up!